I've read one of ABishop's series before and enjoyed it. Haven't had the chance to read this series yet though. Let me know if you've read book one or two and what your thoughts were! I've read all three so far. I was lucky to get an eARC of Vision. I was not impressed with Written In Red and handed it off to my sister saying you may or may not want to read it, I wasn't impressed. Well, she liked it more so I decided to reread it for some reason it clicked. I have read the first two several times and love them on audio book. 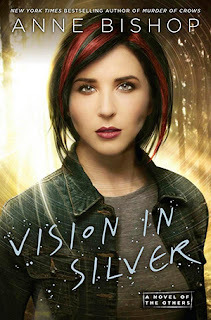 Vision in Silver continues right after Murder of Crows ends and tells how mainstreaming the cassandra sangue isn't going to be easy and the HFL tries to bring down The Others in an unexpected way. I really enjoyed it and have pre-ordered the audio version. I like the slow progression in Meg's and Simon's relationship because it's only been a few months and it's very realistic that it's slow. One negative is that I think Anne Bishop has a tendency to let the big climatic scenes fizzle out. I felt that way about the controller scene in Murder and in Vision when The others realize what the HFL is doing. One day I'll give her a read. So many of yall seem to enjoy her.